Pingel fuel valves pass more gas! Walk into any pit area, pick up any performance magazine and youll find Pingel there. All Pingel products are manufactured from billet aluminum with high quality stainless steel components and are easy to install in minutes without tank removal. Don't let your stock OEM petcock be your carburetors main jet. These valves fit the 1/4" and 3/8" NPT bungs we use for our fuel tanks. 1/4" bungs are typically used for small displacement applications or some dual valve setups. If not sure, ask your sales rep for a recommendation. 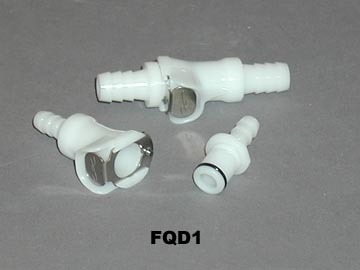 PFV1 - Single outlet - race (no reserve) 3/8" or 1/4"
PFV1R - Single outlet - street with reserve 3/8" or 1/4"
PFV2 - Dual outlet - race (no reserve) 3/8"
PFV2R - Dual outlet - street with reserve 3/8"
PFV3 - Triple outlet - race (no reserve) 3/8"
An economical alternative to the Pingel valves are these brass, chrome plated fuel valves. These valves have a reserve function and a gauze filter and come in two sizes, 1/4" and 3/8" NPT to match our tanks. Great value for money! 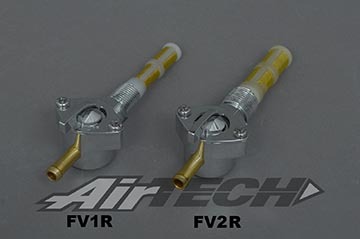 Fuel valve - race, aluminum 1/4"
Basic on/off fuel valve. No reserve, no filter. These CNC machined buttons are designed as a fuel tank hold down when a tank does not have a flat mounting tab in the back. Many of our tanks are manufactured with a 6mm insert just for this purpose. Simply install the grooved button with the included 6mm screw and hook the o-ring over it. You can then weld a tab or hook to the frame and strap the tank down with the o-ring. The included 2" diameter o-ring has about 2.5" reach unstretched, longer o-rings available at additional cost, please ask your sales rep.
Our vintage tanks come standard with the classy polished stainless twist-on fuel cap shown on the left. These caps are internally vented. We glass a matching steel neck into the fuel tank. Pictured with matching fuel neck FN2 - sold separately. 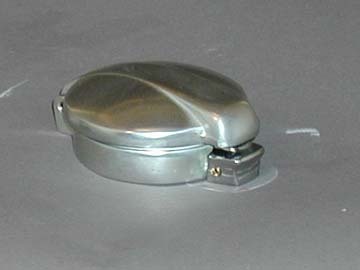 Upgrade your vintage fuel tank with a beautiful polished aluminum Monza style flip-up cap! Available in two sizes, 2" and 2.5" (size refers to cap ID). As a rule of thumb the smaller caps look good on smaller tanks, the large ones on large tanks. We glass a matching, threaded neck into the fuel tank. Upgrade your vintage fuel tank with a beautiful polished aluminum style flip-up cap. This is a big 2.5" cap (size refers to cap ID) that will look good on bigger fuel tanks. Rock your bike quickly from side to side at a standstill and then feel it move as the fuel in the tank sloshes from side to side. Our reticulated fuel cell baffling is designed to combat this sloshing effect that unsettles the bike. It is overexpanded foam, which when stuffed into a gas tank, will stabilize the fuel and prevent the sloshing effect. In the event of a rupture, the fuel flow rate is slowed too. This foam is a 60ppi material and displaces approximately one quart per six gallons of fuel. It is cut into 4x4x12 inch pieces, which collapse easily and can be stuffed into the tank through a filler cap. A normal tank will take between 6-9 pieces to properly fill. The factory boys have been using this trick for years! Hassling with fuel line clamps can be tiresome. Airtech's quick disconnect units solve this problem totally. Factory teams have been using these same items for some time. Our kit comes with a male and a female fitting and has a high fuel flow rate. Sold each. Great to drain fuel inbetween races or disconnect carbs for rejetting. To order call 760-598-3366 NOW!